In the end I went to Comic-Con for 1,5 days. I couldn't take Thursday or Friday off and then I felt that it was better to take the first morning train so that I was in Stockholm by lunch on Saturday rather than just spending a lot of money in order to get to Stockholm and stay an extra night at a hotel. My big plan for Comic-Con had of course been Coronation Elsa, but since that one is now pushed back to just some date in the future I reverted back to rebel cheerleader, jawa and Endor Leia, my three most comfortable costumes. My general impression of Comic-Con was that there was still a lot of focus on games, but there was some interesting panels and stuff. I didn't go to any, but that was because they ones I was interested in took place on Thursday and Friday. II ended up spending all my time with the Nordic Garrison and Nordic Base. As for costumes, it was great to see so many costumes, and quite fun costumes as well. I could hardly recognize anyone, but that's not the point, it was still so fun just seeing cosplayers around. It was definitely the right venue to wear my cheerleader, and the cancan trooper would have worked here as well. Both those costumes have been total flops at the SSFGGC. The best costumes that I saw, and recognized, were the Disney ones. 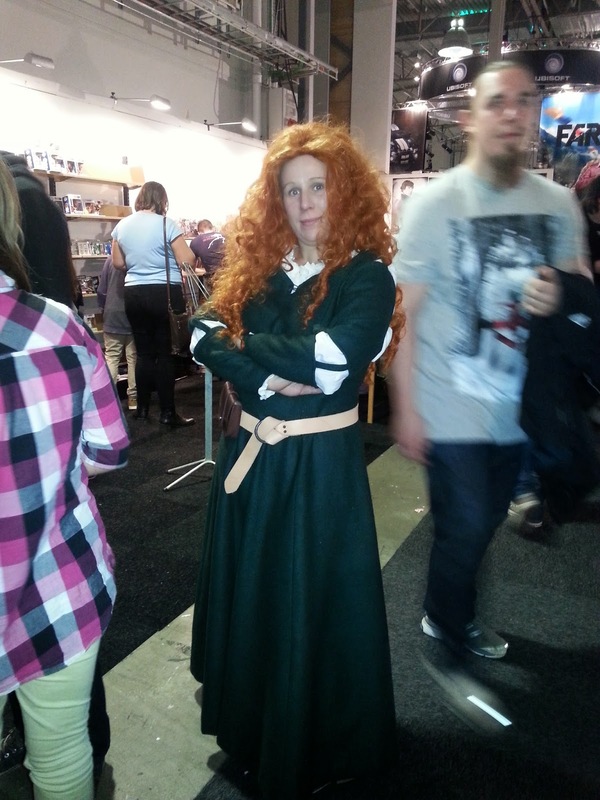 This Merida was great, and the quality of the fabric and stitching was really nice. 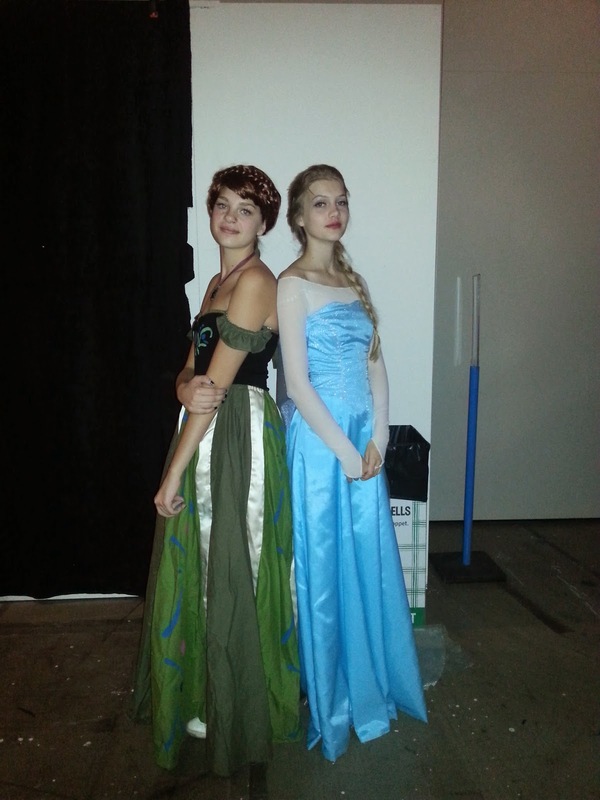 There were a couple of Elsa:s and Annas:s there was another pair of them but I only saw them when one of the was standing eating, and I don't want to take pictures of cosplayers who are "on a break". 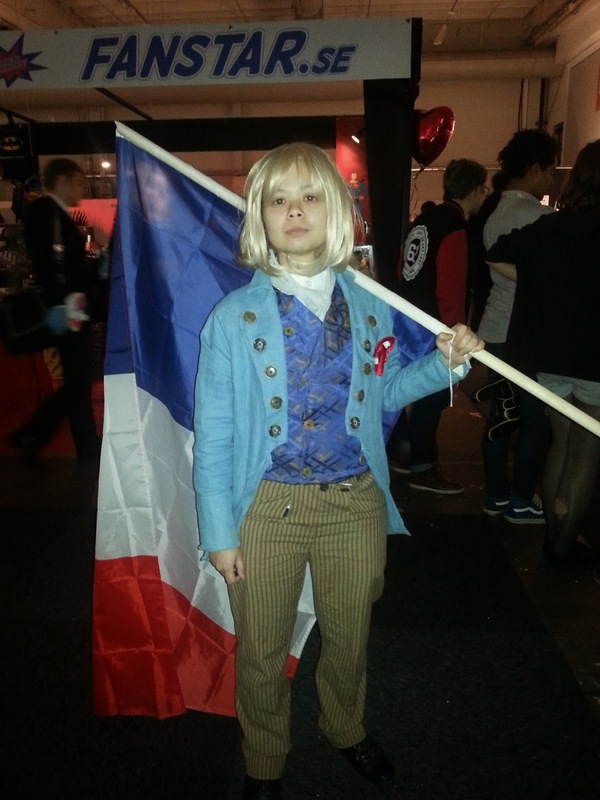 I am a huge Les Mis-fans and it almost made me sad that I didn't have any of my red Enjolras-inspired jackets around so that I could take a picture with her. After this I've been going around humming on Les Mis for two days now. As I said my own costuming was the jawa and Endor Leia. The jawa was my main costume, so I wore it for the parade on Saturday, and after that I ran around with my partner from Finland. He's a wonderful child that has gotten both his parents involved in SW costuming. He's adorable, and has a proper soundssystem with jawa sound files, so we were stopped quite a lot when we walked around. A big problem for me though was that the whole convention hall was darkened down and I could hardly see anything. After all my eyes are covered with black fabric, and right under them I have two glowing lights that totally destroy my night vision. Still the jawa is so much fun to wear. You can jump around and play with people and just act like a big kid. 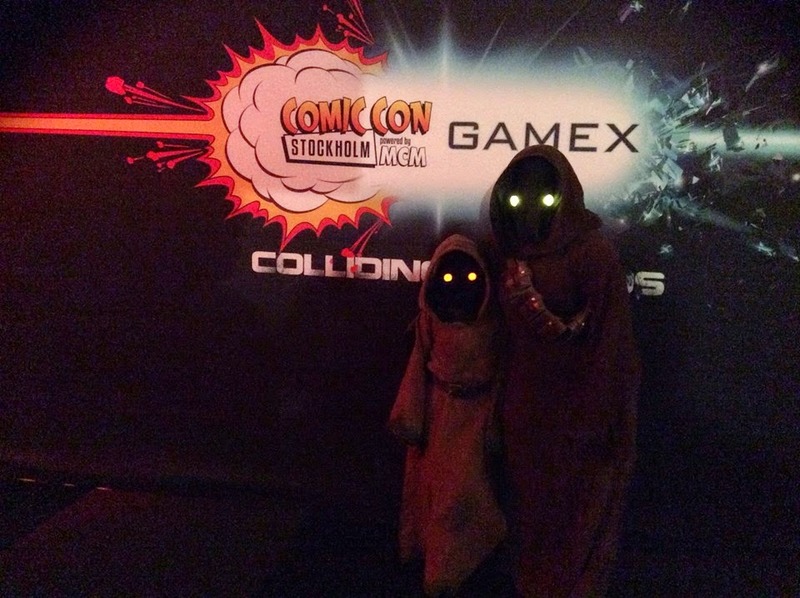 I think I need to wear a sports bra under the costume though, since I got a few comments about being a clearly female jawa. I had brought the Endor Leia as well, and since our regular Leia felt a bit out of sorts for the parade on Sunday I wore it for that, so we would have Han, Luke and Leia present. Even if I was Endor Leia I got a bit of jawa sitting duty and took care of both the Finnish jawa and an even smaller one that is the child of one of our members in Skåne. We got one big photo outside as well, with most of our members in costume. There weren't too many of us from the Nordic Base at this convention, so our NB only photo wasn't quite as impressive. I was out of costume here because I had been in a panel about the Nordic Legions. On Saturday I presented the panel, but since organizers had named it "how to become a stormtrooper" I also brought one of the TK experts from the NG with me. There were around 25 people for the panel, which wasn't too bad since it was the last point on the programme, and collided with a special 30th anniversary screening of Ghostbusters. I also felt that the people that listened were seriously interested, so hopefully we have gotten some new recruits for both the base and the garrison. * a special wave to Johanna that I spoke with for around 40 minutes about making a Leia costume, if you read this* On Sunday Andrew from the NG held the talk, but I went there and assisted him in case there were any questions about soft costumes. Carolina här från comic con. Tänkte om du ville hjälpa mig med Leia mönster och så? :) jag är helt säker på sätta igång nu. Önskar jag hade hunnit klart innan scifi mässan dock. Finns det någonstans jag kan kontakta dig?